FRISCO - Eliezer Alvarez and Andretty Cordero combined for four home runs and 10 RBIs Tuesday night as the RoughRiders sealed the series victory with a 12-4 decision over Corpus Christi before 2,034 fans at Dr Pepper Ballpark. Frisco (4-1) has won four consecutive games, saddling the Hooks with back-to-back losses for the first time in 2019. 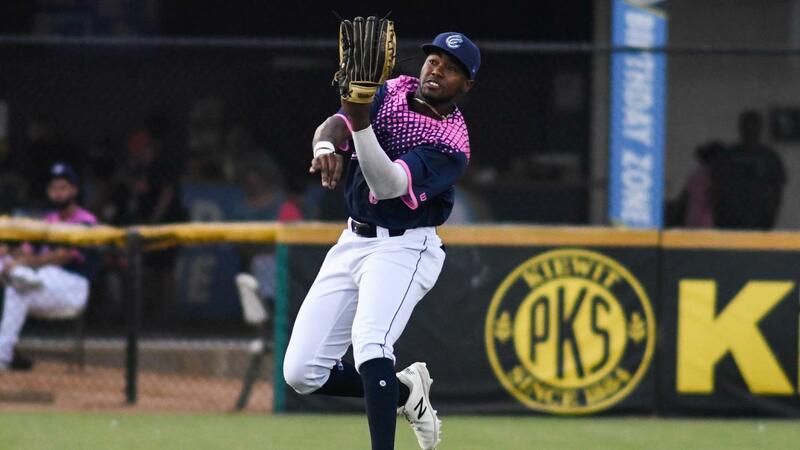 Corpus Christi (3-3) jumped out to a 3-0 lead as Ronnie Dawson opened the game with his first home run of the season, a mammoth poke to left field. With two away in the second, Anibal Sierra seared a line drive into right field, plating J.J. Matijevic from second base. Dawson followed by cranking a double off the fence in right-center for the club's third run. The Riders answered with a run in the second and three unearned markers in the fourth. Following a two-out error committed by third baseman Abraham Toro, Cordero launched the first of his two three-run home runs by turning on an 0-1 pitch from Jose Urquidy. Urquidy (1-1) had yielded just one hit over the first three innings. In the fifth, Frisco sent nine men to the plate, scoring six times on three hits, two walks and a hit batsman. All three hits went for extra bases, including the second three-run Cordero clout, surrendered by Gabriel Valdez, which capped the barrage. Cordero finished the night with a career-best seven RBIs. Pedro Payano (1-0) earned the win after holding the Hooks hitless in his last three frames of work. Locke St. John struck out three over three shutout frames of relief. Alvarez, who cracked an RBI triple in the fifth, delivered solo shots in the sixth and eighth, extending the Riders lead to 12-3. Dawson stroked an RBI double in the ninth off Jairo Beras, completing his three extra-base hit performance. The Hooks aim to halt the skid Wednesday night with Carson LaRue (0-0, 3.60) on the bump. Frisco counters with Wei-Chieh Huang (1-0, 0.00). First pitch 7:05.